The image below shows a view of a fork mounted telescope. 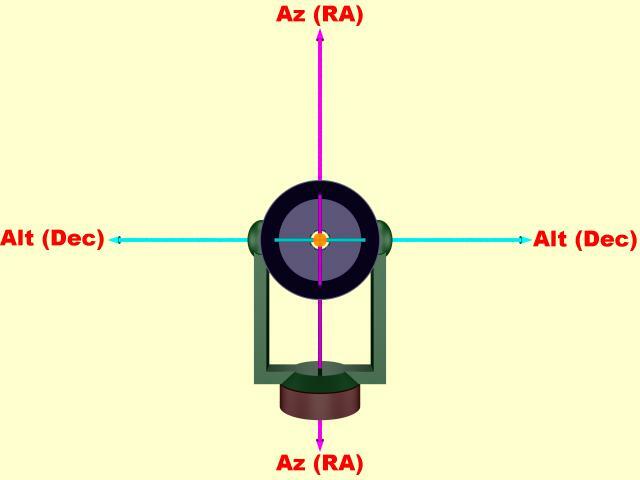 The major axes are the Az or RA axis, the Alt or Dec axis, the optical axis and the nominal pointing axis. 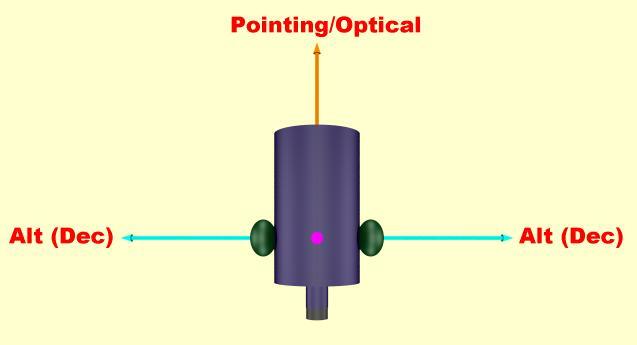 Ideally where the telescope "looks", which is its optical axis, should correspond to where the pointing system thinks it "points", which is its pointing axis. Therefore ideally the optical axis and the pointing axis should coincide, which is true in the image above. The image below shows a view of the telescope from the front. Ideally the Az or RA axis should be at right angles to the Dec or Alt axis. Other terms for "right angles" are "orthogonal" and "perpendicular". So sometimes the axes will be referred to as needing to be orthogonal or perpendicular with respect one another. The image below shows a view of the telescope from above looking down. Ideally the Alt or Dec axis should be at right angles to the optical axis. The animation below shows how the pointing axis and optical axis diverge when the Az or RA axis is not fabricated at right angles to the Alt or Dec axis. As the Optical Tube Assembly (OTA) is raised higher and higher in Altitude, the optical axis and the nominal pointing axes diverge by a greater and greater amount, starting with no divergence when the OTA is at zero degrees altitude (elevation) and reaching a maximum error at the pole of the mount, which is when the OTA reaches 90 degrees altitude. Such an error is referred to as Non Perpendicular Axes Error (NPAE) on Alt/Az mounts or simply as NP on equatorial mounts. It could come about, for example, if one fork arm were raised slightly higher than the other. This type of error first manifests itself the day the mount was fabricated and is thus not always easily mechanically corrected except by re-fabricating or mechanically altering the mount, which may not always be practically possible. It can occur on all styles of mounts, including machined metal mounts such as Fork mounts and German Equatorial Mounts (GEM's), as well as wooden mounts, such as many Dobsonian Alt/Az mounts. On Dobsonian mounts, a worn Teflon pad on one bearing can also give rise to it over time and this can obviously be corrected by assuring that both sides of the rocker provide an even height to the OTA. The animation below shows how the pointing axis and optical axis diverge when the Alt or Dec axis is not perpendicular to the optical axis. In this scenario, unlike NPAE/NP, the optical axis and pointing axis have a fixed angular separation which is independent of the altitude of the optical tube assembly. Such a pointing error is referred to on Alt/Az mounts as Collimation Error in Azimuth (CA) or on equatorial mounts as Collimation Error in Hour Angle (CH). This type of error can come about for a variety of reasons, including if the optical elements are not collimated, or if the optical path is not parallel to the long axes of the OTA. On GEM's, a common problem is when the OTA is not mounted exactly at right angles with respect the Dec axis due to the OTA being mounted at a slight rotational angle on its dovetail plate or within its rings, or the dovetail plate or ring assembly itself being mounted at a slight rotational angle on the mount head. 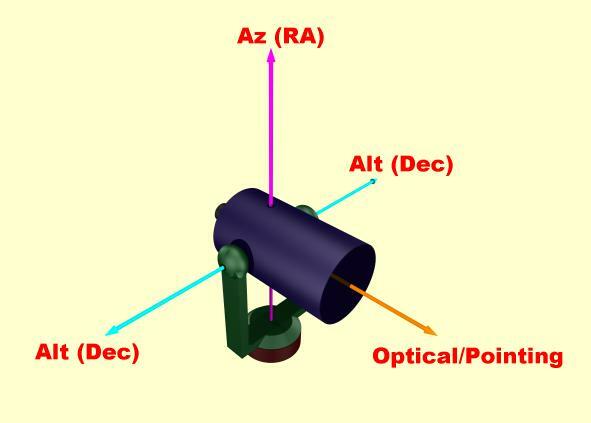 Since the optical encoders, which form part of the pointing system, are fitted to the Az (RA) and Alt (Dec) axes, they are not "aware" if the OTA is rotated with respect the rest of the mount. The Argo Navis™ Telescope Pointing Analysis System™ (TPAS™) can analyze and potentially compensate for NPAE/NP, CA/CH errors plus several other systematic fabrication errors that are common within all mounts to some extent. The ability to compenstate for mount fabricaton errors differentiates a Digital Telescope Computer™ (DTC™) from Digital Setting Circles (DSC's).